In physics and chemistry, a nucleon refers to any subatomic particle found in the nucleus of an atom. For instance, protons and neutrons are nucleons, since they are in the nucleus of the atom. Nucleons are made of Quarks. The main types of nucleons are protons and neutrons. A proton, as its name suggests, has a positive electric charge, and a neutron has a neutral electric charge (meaning that it has no charge). 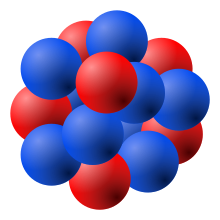 The two in the nucleus of the atom make a positive charge, since the neutron has no charge at all. Electrons are not nucleons, because they are not in the nucleus of the atom. The other types of nucleons are antinucleons. These are the antiparticles of the nucleons. The fundamental force responsible for holding the nucleons together in the nucleus is called the strong force. This page was last changed on 21 May 2017, at 02:09.